Sorry, we missed out on a whole month of these because I was out for the birth of my first child! We had a son, Graham, on February 7th. But we are back in action on these! 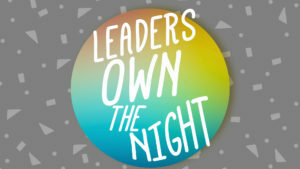 Wednesday Teaching Series: Leaders Own The Night: This was a night that we gave the reigns to out volunteers. They planned everything. Our staff just helped them facilitate and pull it off. They made the order of service, the game, picked the set list, played in the band, taught the message and planned the event after. Sermon in a Sentence: You can change the world around you right here and right now, but you need to allow God to change you first. Changed people change things. Understandable Message: In our junior high room one of our leaders shared about how we was able to have a front row seat to life change of one of his friends because he reached out to a kid who was by himself all of the time at his school. In our high school, we had “soap box” sermons. We had 5 leaders share for 5 minutes about how they have seen God change them so they can help others see who God is. It was so fun for our students to hear some of our leader’s desire for them as their leaders. Element of Fun/Positive Environment: I loved the game they choose to play. It’s called “Es tu eleccion” (Spanish for “It’s Your Choice”) a game we played at a CIY summer camp. Basically it’s set up like the game show Let’s Make A Deal but the host will scream “Es tu Eleccion” and our worship leader would play Spanish style music on his guitar. It was a strong bit. Students loved and the prizes got bigger and bigger as the game went on. Also, our leaders planned a GLOW DANCE after service (our students love to dance and have fun) and we had an ice cream truck come out for the night. Students also loved the ice cream. Favorite Moment: Seeing our leaders take over the night and just killing it. From the planning to the teaching to the execution of the night. I was a proud leader.